Provides extra protection for skin the perfect all-over body treatment to counteract sun damage and extreme dryness. BWC Extra Rich Fragrance Free Hand and Body Lotion deeply moisturizes, softens, and provides extra protection for your skin the perfect all-over body treatment to counteract extreme dryness. Natures rich emollients shea butter, jojoba, and tamanu combined with effective, natural humectants and anti-oxidants smooth, nourish and replenish your skin. This special, botanical formula features arnica and calendula and is fragrance free the ultimate in natural skin care. Made with premium and natural ingredients. Paraben free. No animal ingredients. 100% vegan, vegetarian. No synthetic or engineered fragrances. No animal testing. Extra rich hand and body treatment. Purified water, Aloe barbadensis (aloe vera) leaf juice, Helianthus annuus (sunflower) oil, vegetable glycerin, capric caprylic triglycerides, glyceryl stearate, glyceryl stearate citrate, cetyl alcohol, tocopherol acetate , Rosa canina (rose hip) oil, Simmondsia chinensis (jojoba) oil, Lavandula angustifolia (lavender) hydrosol , Butyrospermum parkii (shea) butter, Arnica montana (arnica) extract, Olea europaea (olive) oil, panthenol, allantoin, tocopherols, magnesium ascorbyl phosphate, Anthemis nobilis (chamomile) extract, Calendula officinalis (calendula) extract, Camellia sinensis (green tea) extract, Callophyllum inophyllum (tamanu) oil, phenoxyethanol, ethyl hexyl glycerin. 41% organic content. Certified Organic. 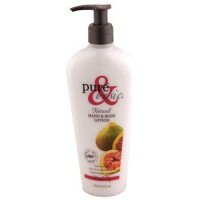 For maximum moisturizing benefits, use after shower or bath. 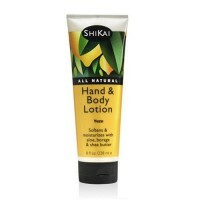 For soft, smooth hands, use often especially after washing.